I am very much a warm weather person. There is basically nothing I like about the winter. I’m pretty sure my blood is about the consistency of water. I am always cold! 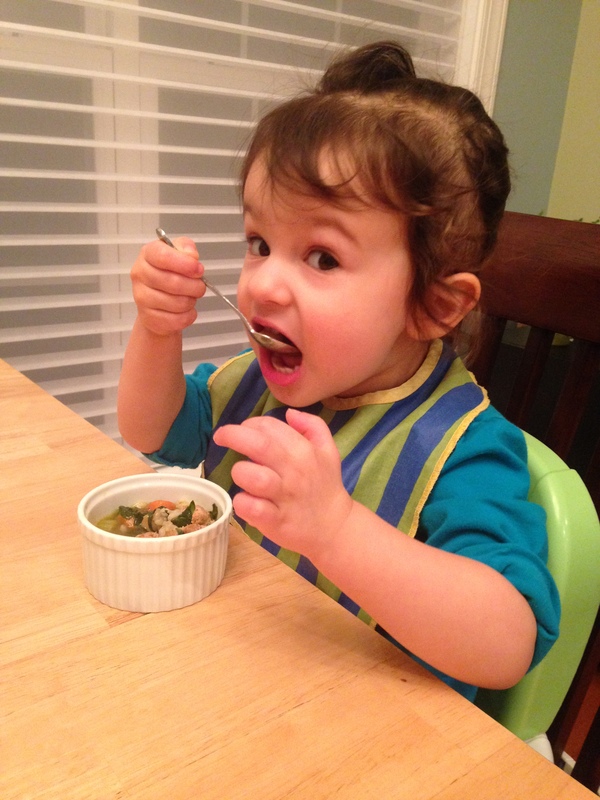 One coping mechanism that gets me through the long, cold winters is soup. I used to find them intimidating to make until I realized that there’s really no wrong way to make a soup. It’s kind of like making a salad. There really aren’t any rules. 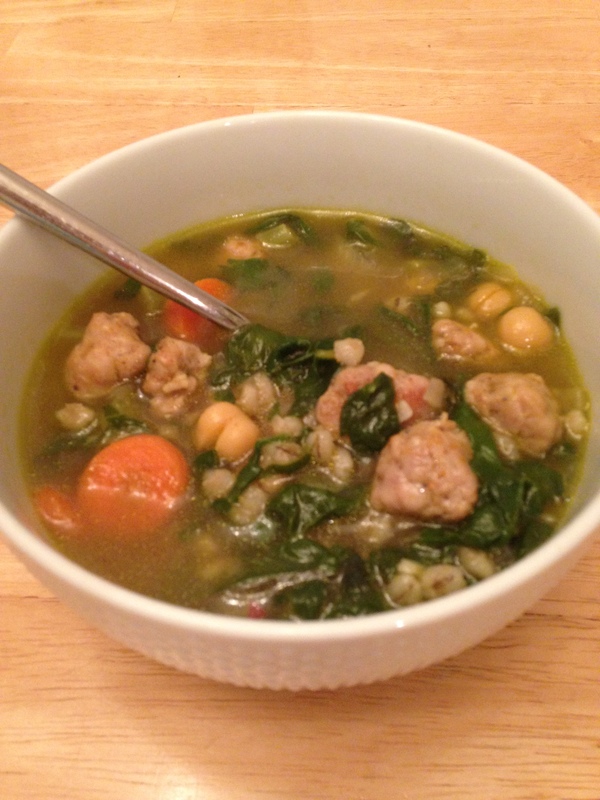 Recently I whipped up this recipe for hearty chicken sausage soup. I like it for many reasons. First, I love the in-house sausage sold at the Whole Foods. I tend to steer clear of most packaged sausages because of the junk that comes along with them (nitrates/nitrates, MSG, propyl gallate — say what?). But the Whole Foods sausage I buy contains none of these mysterious items. Second, the recipe contains only “good carbs,” by which I mean beans, legumes, whole grains, and starchy vegetables. Both the barley and the chickpeas in this recipe are loaded with fiber – important for digestive health and also good for fat loss – and vitamins and minerals. In fact, I find soups are a great way to experiment with all those good carbs you can find in the bulk bins at the grocery store. Ever try cooking with wheatberries? You should! You could easily swap out the barley for them in this recipe. Oh and here’s a cook’s tip: barley and a lot of other whole grains can take a LONG time to cook. Make a huge batch and then freeze leftovers in smaller portions for future use. I find that it helps to freeze them in zip-top plastic bags in a thin layer, as the increased surface area makes for faster thawing. The third thing I like about this recipe is the rainbow chard. I think I read recently that “chard is the new kale.” When you look at all it has to offer, the reputation is warranted. One cup of cooked chard has four grams of dietary fiber (15% DV) and is also a good source of vitamins A, C, and K, among others. Pregnant women – who need about 50% more iron in their diets than non-pregnant women – should know that a one cup cooked serving offers four milligrams of iron, or 15 percent of their DV (22 percent for non-pregnant women). Now, I always make my own chicken stock, but I appreciate that I’m a bit of an odd duck when it comes to this sort of thing. 🙂 I really do think it tastes way better than what you buy in a can or carton, but I appreciate the time and effort that goes into making it. This may spell F-U-N for me, but it won’t for everyone! So feel free to use what makes most sense for you! Heat 1 tablespoon olive oil in a stainless steel dutch oven over medium heat. Slice the sausage into rings, then cut the rings in half. Add the sausage to the pan and saute until cooked through, about 4-5 minutes. Remove the sausage from the pain but leave any remnants behind. Stir in the onion, celery, carrots, and a bit of salt to the pan, scraping the bottom of the pan to free up any sausage remnants. Saute until the vegetables are tender, about 5-10 minutes. And the rainbow chard and saute until wilted, about 3 minutes. Mix in the garlic and stir until fragrant, about 1 minute. And the chicken stock, barley, and chickpeas. Stir. Bring to a low simmer. Add salt and pepper to taste and serve. Feel warm and happy.